Brendan Jamison was born in Northern Ireland and graduated with a Master of Fine Art from the University of Ulster. 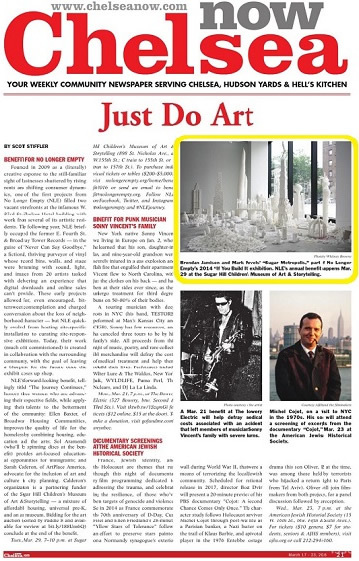 He also studied the history of Western architecture at Oxford and interactive art at MoMA, New York. He has delivered lectures at universities in America, China and Europe. Every week, Jamison receives commission requests from across the world, ranging from corporate clients and public museums to foundations and private art collectors. 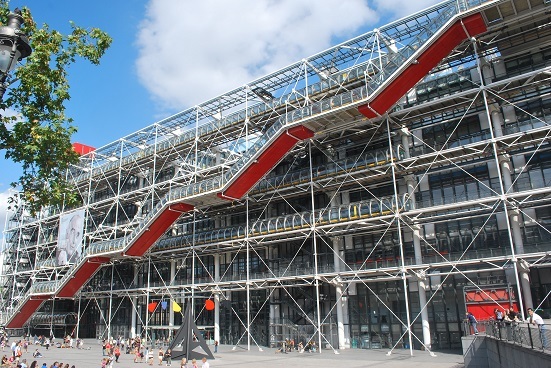 Highlights include sculptures of Tate Modern and 10 Downing Street in London, the Great Wall of China in Beijing and commissions by Vogue Italia in Milan and the Centre Pompidou in Paris. His artworks are held in many significant collections across the globe and he has received over 1,000 pieces of media coverage spanning art magazines, newspapers, books, television and radio. 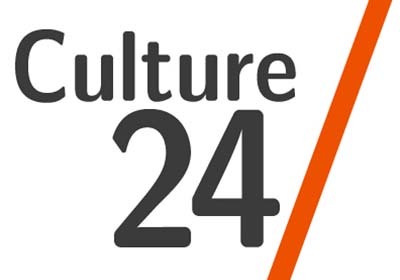 As a learning resource for secondary level pupils, the Arts Council of Northern Ireland [ACNI] has created a short video interview with Brendan Jamison. The film series ties in with a new initiative of lending contemporary art to schools across Northern Ireland. Jamison states "the aim is to inspire the next generation of creative thinkers at a pivotal point in their education, helping to expand the minds of young people and encourage teenagers to dream of ambitious futures where they can bring creative magic to all aspects of society". 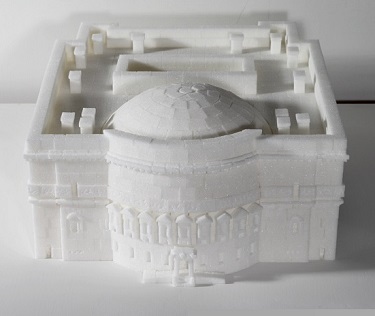 ACNI owns three of Jamison's sculptures, one of which, a sugar cube carving of Sir Henry Tate's Mausoleum, is on show for six months at Belfast Model School for Girls. Brendan Jamison and artist Ciaran Magill are in Cambridge, the medieval university city founded in 1209. 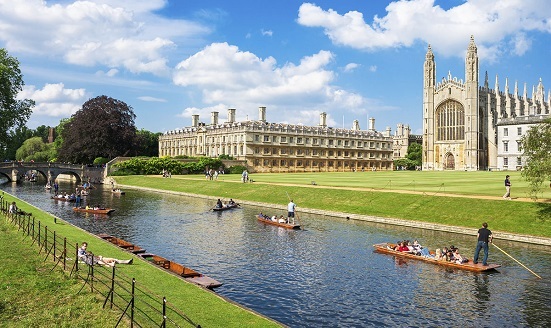 Spanning 31 colleges along the banks of the River Cam, the city is rich with Tudor and Gothic architecture. 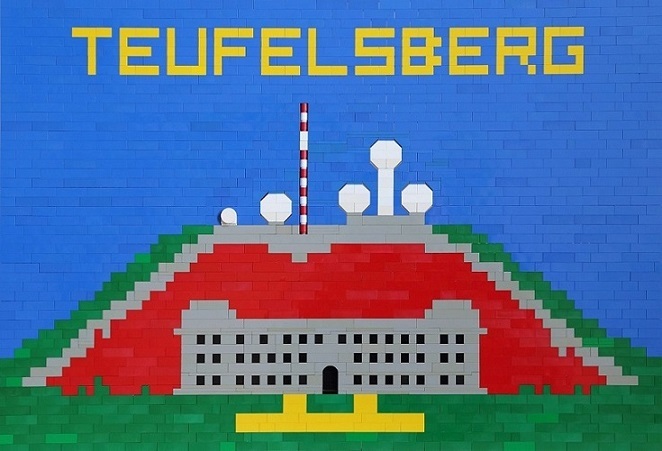 In 2013, Jamison was invited to deliver a lecture at the University of Cambridge based on his original research into Teufelsberg, a Cold War listening station located on an artificial hill in Berlin, Germany. 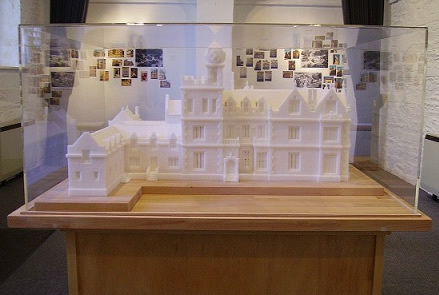 In 2014, he exhibited an architectural sculpture at the library of the Gonville and Caius college. 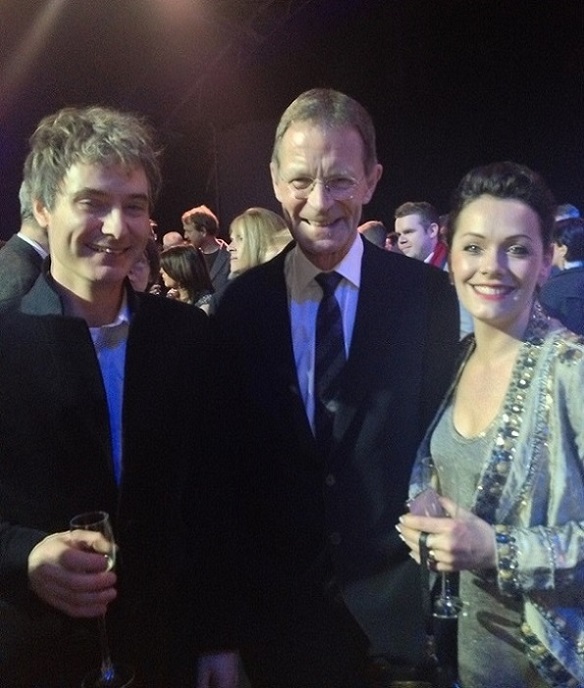 The exhibition presented a selection of contemporary Irish art and was curated by Richard Gordon. For a group exhibition at Platform Arts, Belfast, Brendan Jamison has created a new series of 10 works in response to desert drone strikes in the Middle East. 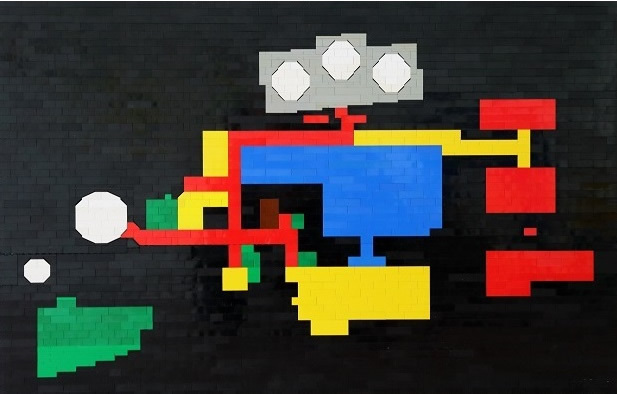 The plastic block artworks begin with an aesthetic of pristine surfaces and glorious vibrancy. However, as the series progresses, the imagery becomes more disruptive and distorted as the materials are burnt, melted and torn apart through gun fire. Like the devastation caused by war itself, the deliberate destruction of the plastic blocks reflect the brutality of bombs and bullets, on both the human body and the environment. However, the absence of figures from each scene references the news footage of such drone strikes whereby it often appears like a scene from a movie, rather than real life. The imagery can also be read as stills from a violent computer game whereby human life becomes extinguished in the blink of an eye. The series reflects on the horrors and tragedy of contemporary warfare but it also explores how we become seduced by the spectacle and hypnotic allure of the warm colours of an explosive detonation, as seen from the comfort and safety of our own homes. RORY McILROY, 2017, portrait with 3145 wooden golf tees, 150 x 150 cm. Created by Brendan Jamsion and his studio fabricator David Turner. 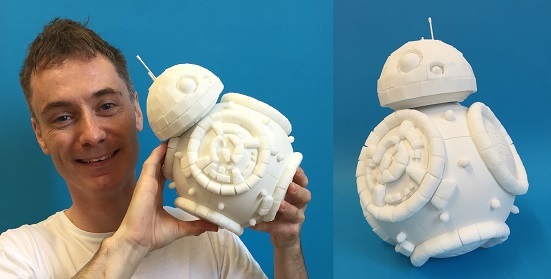 During April 2017, Brendan Jamison created a Sugar Science project in Dubai with his sculpture partner Mark Revels. 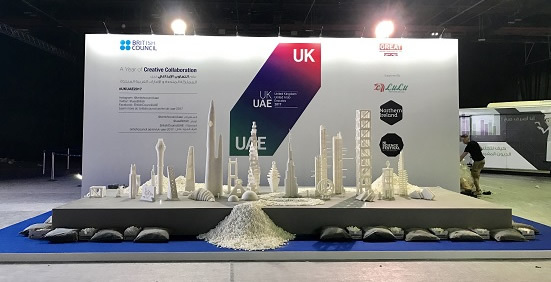 Commissioned by the British Council, the interactive sugar cube sculpture installation was on display at THINK SCIENCE at the Dubai World Trade Centre from April 18-20. For further images please CLICK HERE. 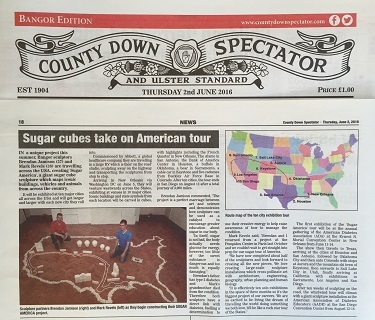 SUGAR DEMOCRACY (2016) Brendan Jamison and Mark Revels, carved sugar cubes, 250 x 1800 x 2000 cm. Short documentary film. 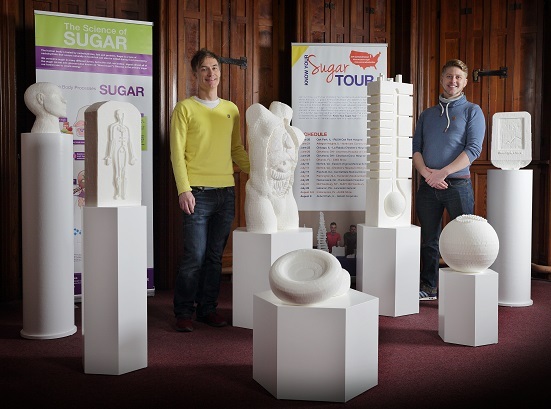 Brendan Jamison and his sculpture partner Mark Revels have launched Sugar Democracy, their largest sugar cube project to date. The giant interactive sculpture is commissioned by IZOLYATSIA, an international foundation for arts and culture, based in Kyiv (Kiev). Through a fun and playful approach, Sugar Democracy celebrates the power of mass-collaboration and encourages all members of the public to participate, irrespective of age, gender, culture or race. Ukraine is a world-renowned leader in the sugar industry, a giant in the field of agriculture. Historically, the wealthy sugar magnates, like the Tereshchenko dynasty, were among the most active philanthropists engaged in charity activities, giving Ukraine numerous buildings, cultural and educational institutions, as well as art collections, now kept in national museums. 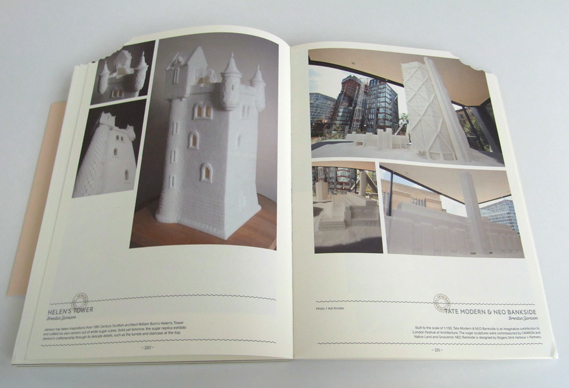 The Sugar Democracy project begins with a reference to historical Ukrainian architecture, with the central part of the installation being a sugar model of the Teacher’s House in Kyiv. Originally built in 1912 for the Kyiv Pedagogical Museum, the building famously hosted Ukraine’s first Parliament, the Central Council of Ukraine, from 1917-1918. The Teachers’ House epitomises a kind of place where culture and education give rise to democracy. 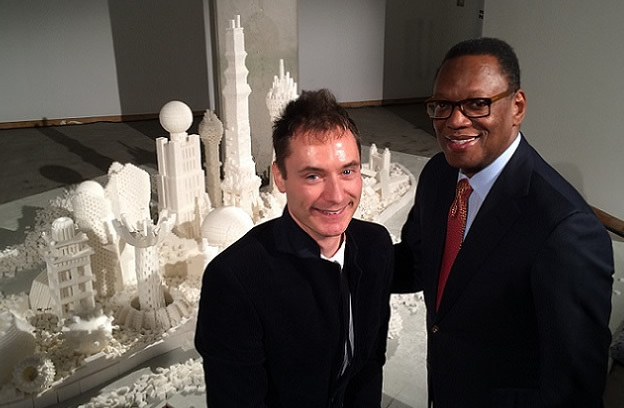 Surrounding this model, Jamison and Revels have created hundreds of contemporary sculptures, expanding outwards in a metropolis of sparkling sugar crystals. 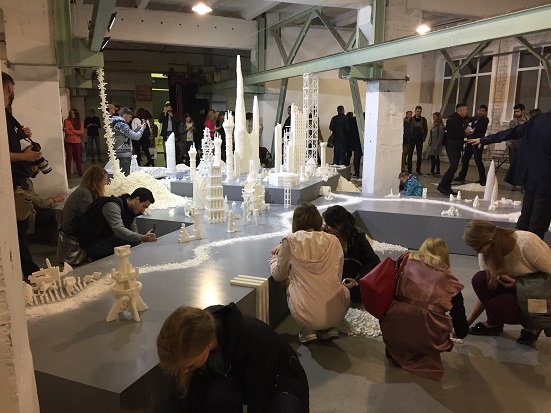 They also taught a group of Ukrainian architecture students how to construct buildings in sugar cubes and these small works surround the central section of the installation. Their innovative approaches to the medium saw the students highly commended during the speeches on the opening night, with particular praise for Катерина Цигикало (Kateryna Tsyhykalo), Лєра Павлова (Lera Pavlova), Ігор Стєшин (Igor Steshyn), Софія Рохманійко (Sonya Rohmanijko) and Юлія Джулай (Julia July). Audience interacting on the opening night of SUGAR DEMOCRACY (2016) Brendan Jamison and Mark Revels, carved sugar cubes, 250 x 1800 x 2000 cm. 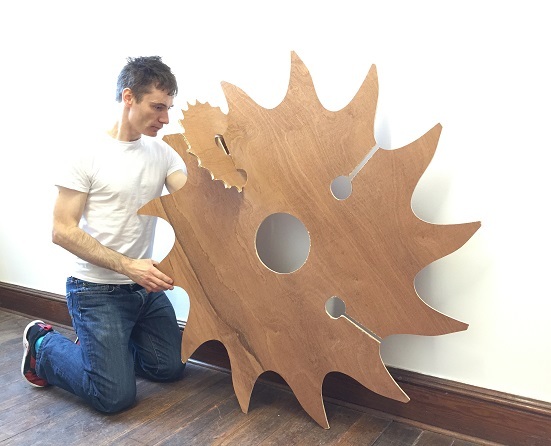 Brendan Jamison is presenting a new circular saw sculpture as a work-in-progress in the RAW exhibition at Catalyst Arts in Belfast. The group show focuses on the theme of unfinished artworks which have been taken directly from the artist's studio while still in a transitional state of flux. RAW opens on Thursday 7 April from 6pm to 9pm. The exhibtion continues until Thursday 14 April 2016. Free Entry. Opening hours: Tuesday to Saturday from 11am to 5pm. 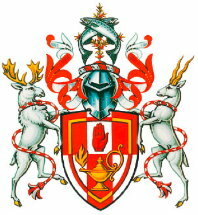 Location: 5 College Court, Belfast, Northern Ireland. Image above: Circular Saw Blades (2016) Brendan Jamison, wood, 120 x 120 x 35 cm. 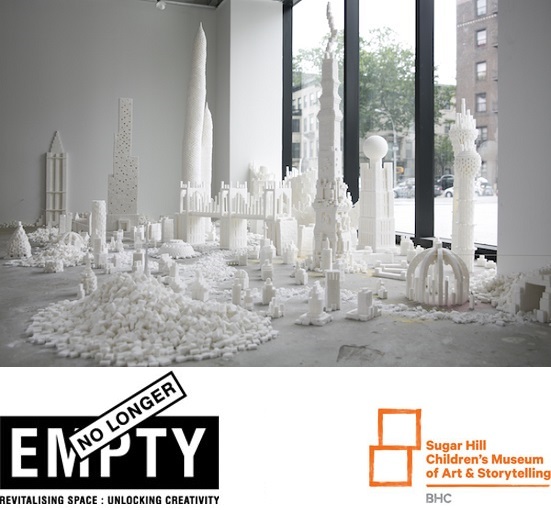 New York Sugar Metropolis, created by Brendan Jamison and Mark Revels, is currently in a media frenzy across NYC as it promotes the upcoming annual benefit of No Longer Empty (NLE) on March 29, 2016. The event will take place at the Sugar Hill Children's Museum of Art and Storytelling, the site where the sugar cube installation was commissioned back in 2014. Many of the elements of the sculpture project remain in the permanent collection of the museum. 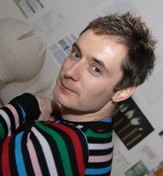 Brendan Jamison has been accepted into the 'Fellowship' of the Royal Society of Arts in London. Past Fellows have included Karl Marx, Marie Curie, Benjamin Franklin and Charles Dickens, while current Fellows include Professor Stephen Hawking. 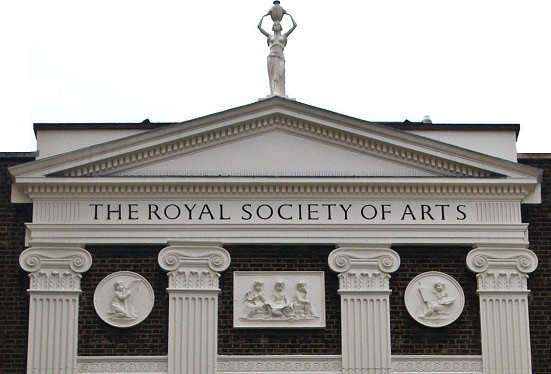 Founded in 1754, the RSA held its first annual exhibition of contemporary art in 1760, with exhibiting Fellows Thomas Gainsborough and Sir Joshua Reynolds later forming a spin-off organisation in 1768, the Royal Academy. The RSA was granted a royal charter in 1847 and members are awarded the post-nominal letters FRSA. The mission of the RSA is to enrich society through ideas and action. It is based on a belief that all human beings have creative capabilities that, when understood and supported, can be mobilised to deliver 21st century enlightenment. The RSA works to bring about the conditions for this change, not just through the Fellowship, but also in institutions and communities. By sharing powerful ideas and carrying out cutting-edge research, the RSA builds networks and opportunities for people to collaborate - creating fulfilling lives and a flourishing society. 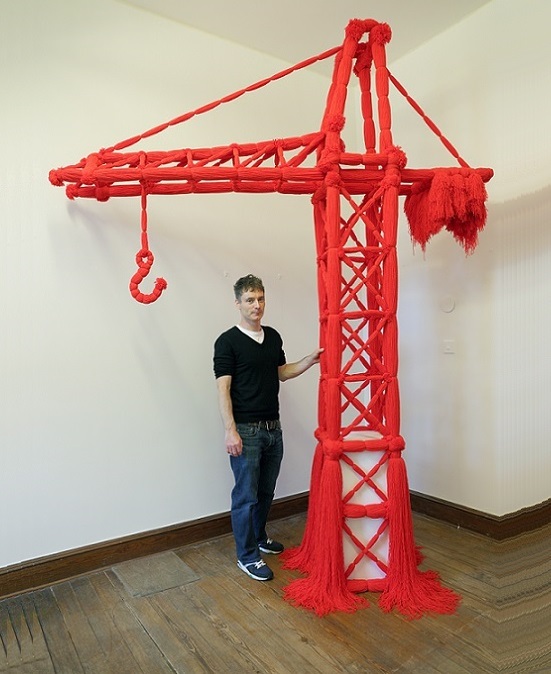 For his latest project exploring the theme of 'androdgynous aesthetics', Brendan Jamison has created a wool crane sculpture for a group exhibition at the Ulster Museum in Northern Ireland. The 3 month show runs until Sunday January 3, 2016. 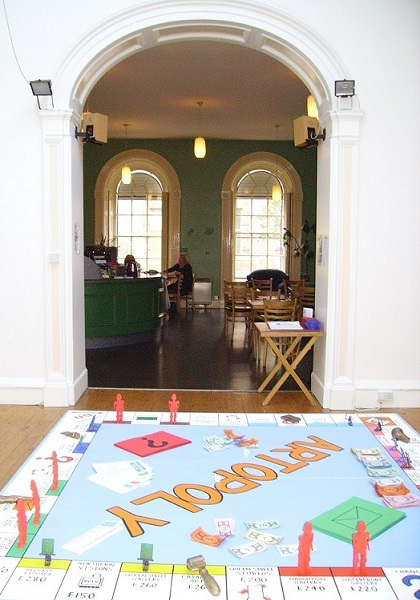 Opening hours are from 10am to 5pm Tuesday to Sunday Free Entry. For further images please CLICK HERE. 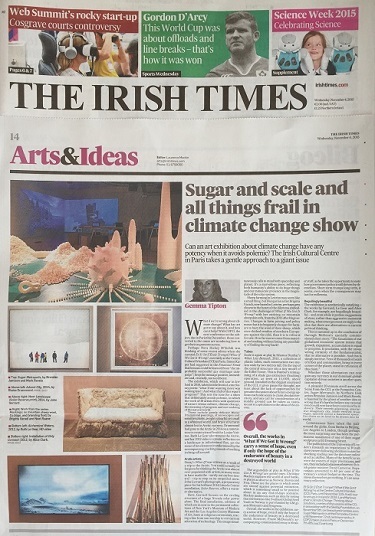 Brendan Jamison and his sculpture partner Mark Revels are in Venice during September 2015 on a research visit to the 56th Biennale, entitled 'All the World's Futures'. Established in 1895, it is the largest and longest running international art exhibition on the planet. Each participating country has a special national pavilion at the Biennale, showcasing artists who push the boundraries of contemporary art. 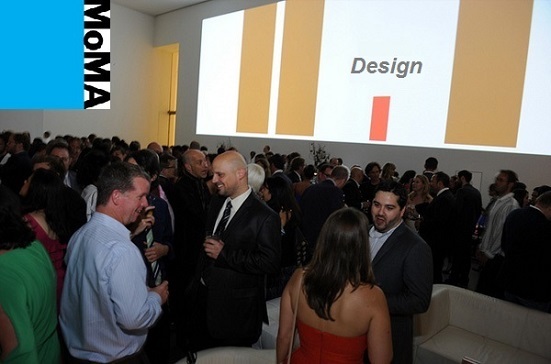 The event attracts over 300,000 visitors throughout its 6 month run and it continues until November 22, 2015. BIOLOGICAL ARCHITECTURE (2015) Brendan Jamison and Mark Revels. Carved sugar cubes. 60 x 380 x 180 cm. 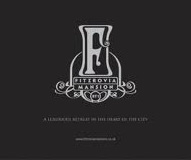 Commissioned by Abbott FreeStyle in association with RJM Design. Installed at the New Orleans Ernest N. Morial Convention Center for the annual conference of the American Association of Diabetes Educators. 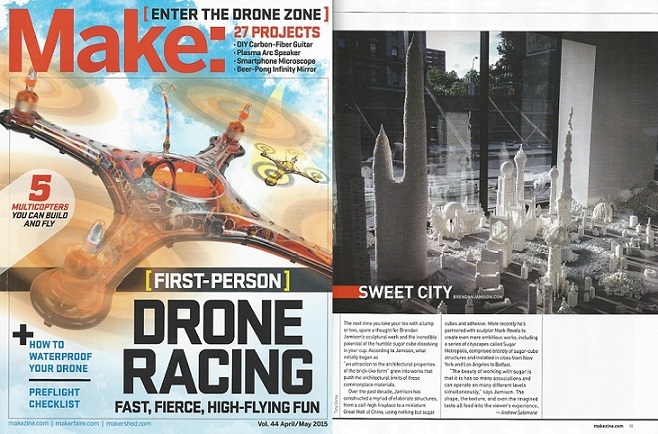 On June 4 at MoMA (The Museum of Modern Art, New York), the sugar cube sculpture commercial by Brendan Jamison and Mark Revels is on the shortlist for 'Best Design' category at the 23rd Annual AICP Awards, the Association of Independent Commercial Producers. 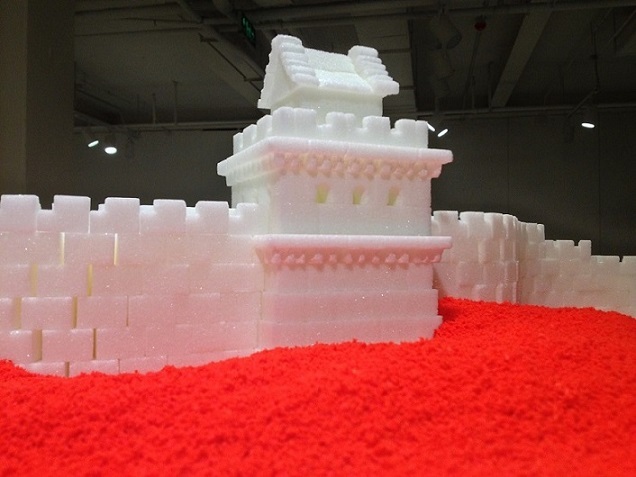 Created by Harvest Films for the Brita water filter company, the sugar cube city will be screened at 6:30pm during the announcement ceremony and will enter the archive of MoMA's Film Department. 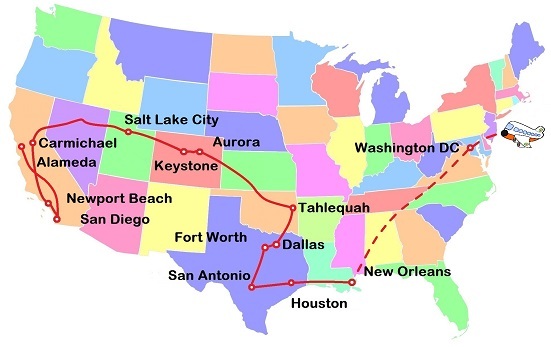 It will also tour to museums throughout America during the second half of 2015. Click above to watch the commercial. 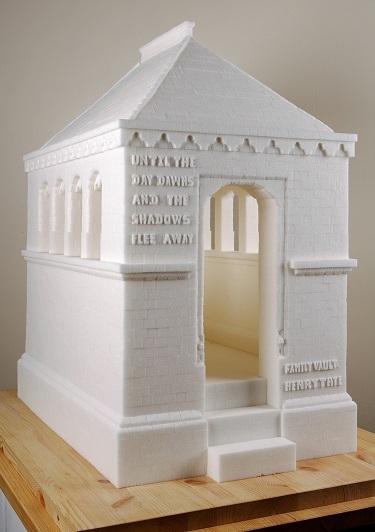 Brendan Jamison’s carved sugar cube sculpture of Sir Henry Tate’s Mausoleum has been published by Oxford University Press in a hardback encyclopedia of 897 pages: ‘The Oxford Companion to Sugar and Sweets’, edited by Darra Goldstein (ISBN 978-0-19-931339-6). As a gift to the nation, sugar cube manufacturer Henry Tate donated his art collection and the funds to build the first Tate Gallery, now known as Tate Britain in London. Jamison’s intricate carving features detailed lettering through a pioneering technique he developed specifically for the project. It was originally exhibited at West Norwood Cemetery in London, the burial place of Sir Henry Tate. 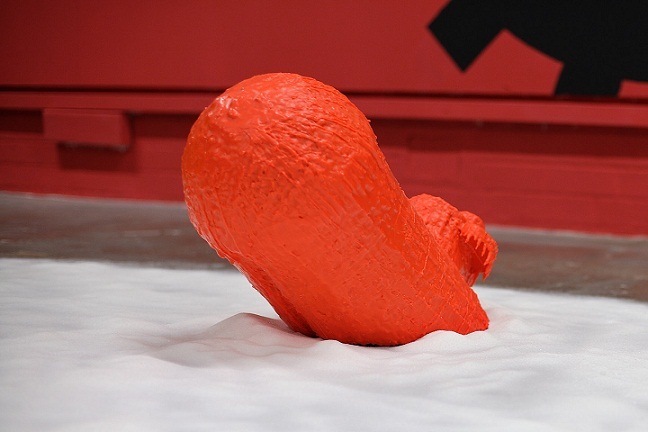 The sculpture was then exhibited from October 2014 to January 2015 at the Royal Ulster Academy of Arts annual exhibition in the Ulster Museum, Belfast. 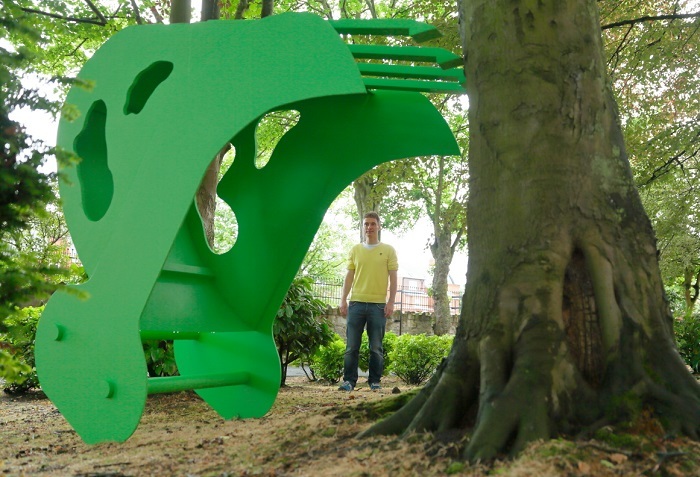 The Arts Council of Northern Ireland subsequently purchased the piece, making it the third Jamison sculpture to be added to their contemporary art collection. 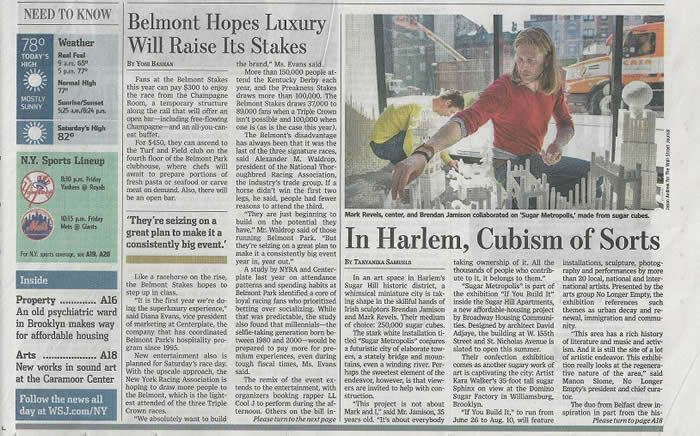 For further images, please visit the sugar cube page - CLICK HERE. 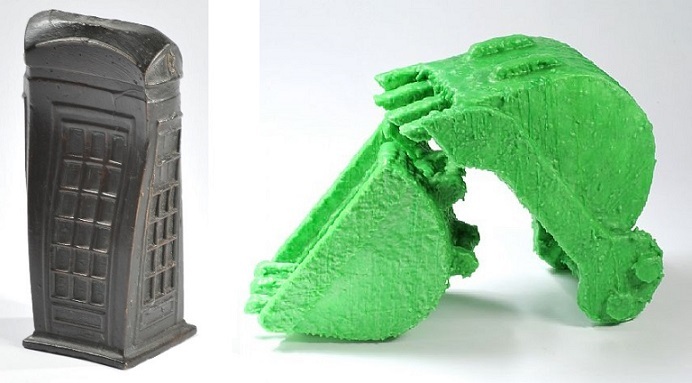 SQUEEZED TELEPHONE BOX (2005) bronze, 15.5 x 6.5 x 5 cm and GREEN DIGGER BUCKET COUPLE (2008) microcrystalline and paraffin wax over wood, 46 x 56 x 29 cm. Photography: © John Ross & Co.
A rare bronze telephone box and a pair of wax digger buckets by Brendan Jamison are currently on display at Ross's Auctions in Northern Ireland. The artworks are being sold in the Stephen Hylands Contemporary Art Collection, with all 96 lots scheduled to be auctioned at 7pm on Wednesday 13 May 2015. Location: 37 Montgomery Street, Belfast. Opening times: Monday to Friday from 9:00am to 5:00pm. ADMISSION FREE. 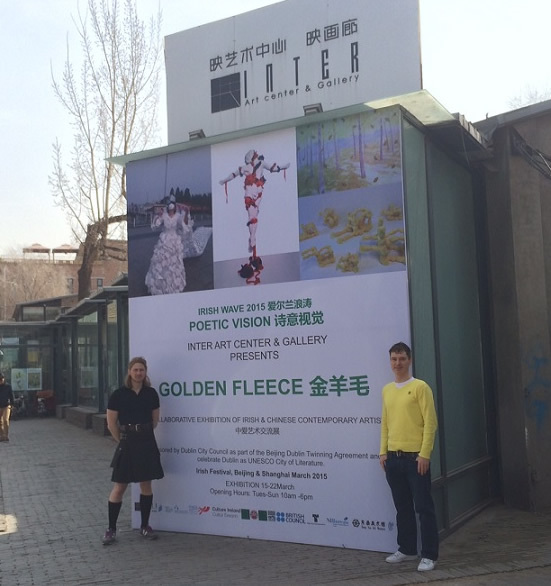 Mark Revels and Brendan Jamison outside their exhibition at the Inter Art Center, 798 Art District, Beijing. During March 2015, Jamison was displaying works in 4 exhibitions in China at the 6th annual 'Irish Wave' festival in Beijing and Shanghai. 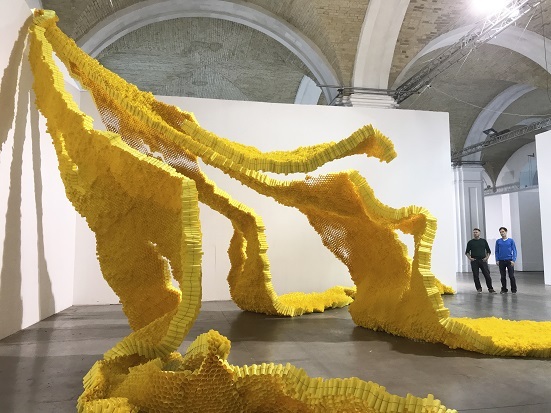 The first exhibition, 'Golden Fleece', opened on March 15 at the Inter Art Center in the 798 Art District of Beijing and featured a collaboration with Mark Revels. The sculpture duo presented a body cast installation with felt virus spheres and wool forklift trucks. Meanwhile, in the business district of Beijing, 'A Meditation in Time of War' opened on March 16 at the Dong Yue Art Museum. The preview was filmed by China Central Television, the most watched channel in Asia (see clip above). 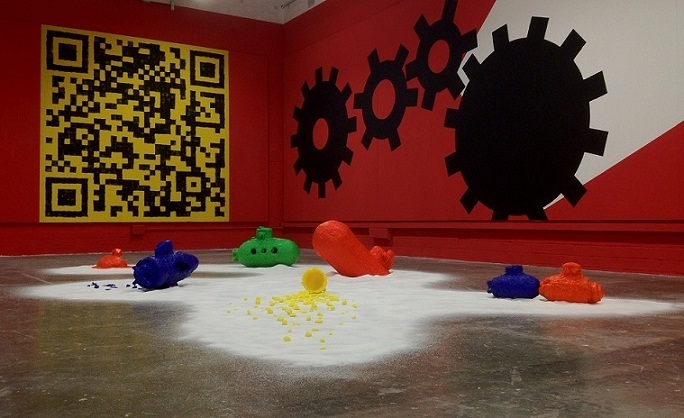 The following week, 'Small World' opened on March 21 at the San Wei Art Center in the M50 Art District of Shanghai. 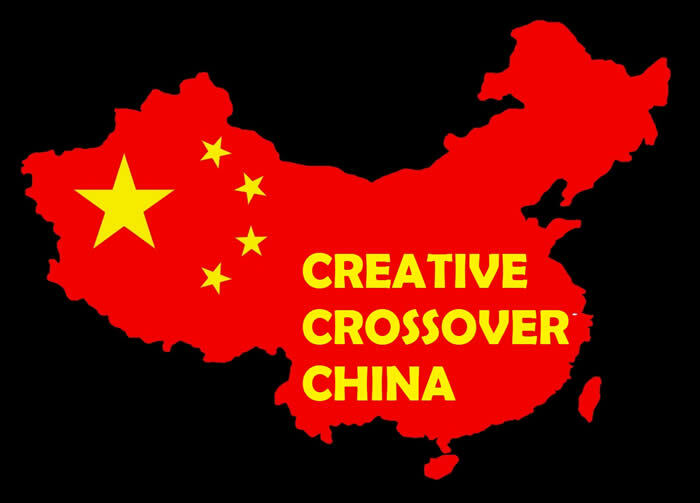 The final show, 'Intimate Perspectives' took place at the Shanghai Grand Theater and was accompanied by a series of artist talks on March 23. Film still from Brita commercial. Directed by Matthias Zentner. 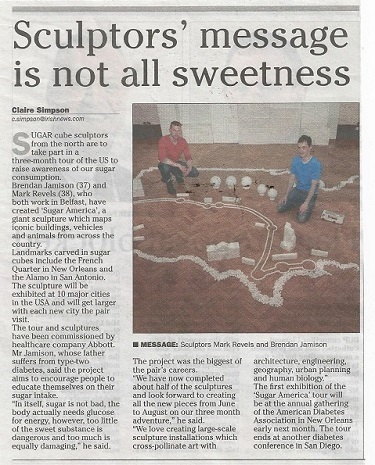 SUGAR BIOLOGY (2014) Brendan Jamison and Mark Revels. 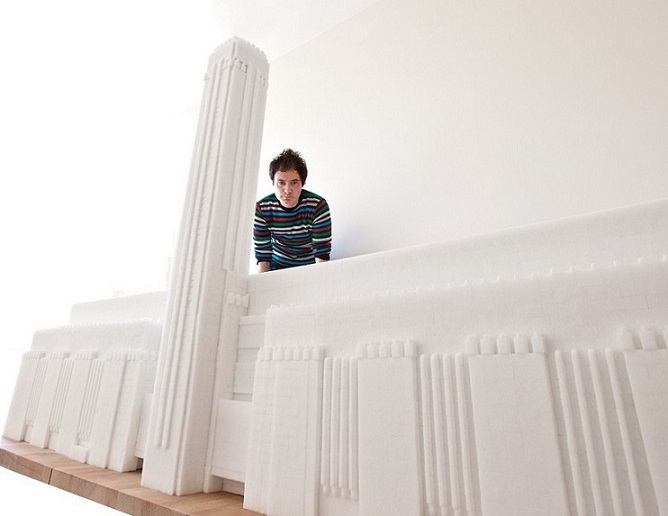 221,314 sugar cubes. 100 x 800 x 400 cm. Commissioned by Brita and Harvest Films, Los Angeles. 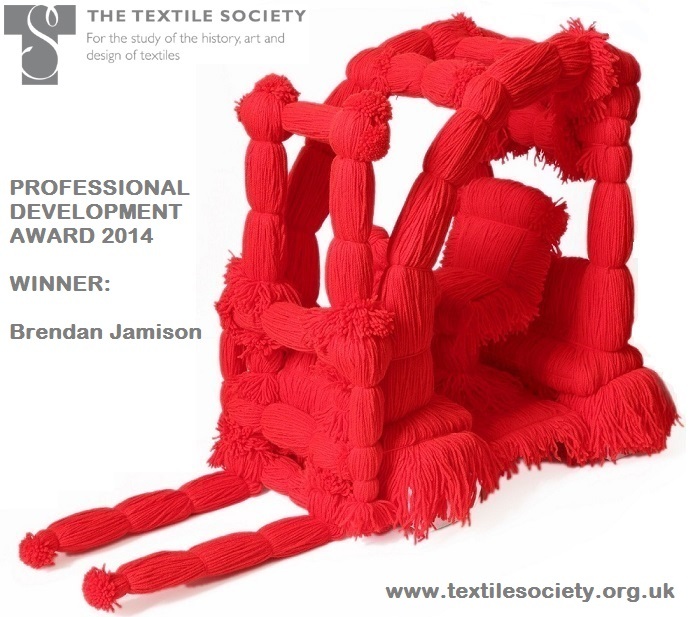 On October 1, Brendan Jamison won the annual Professional Development Award from the UK Textile Society. 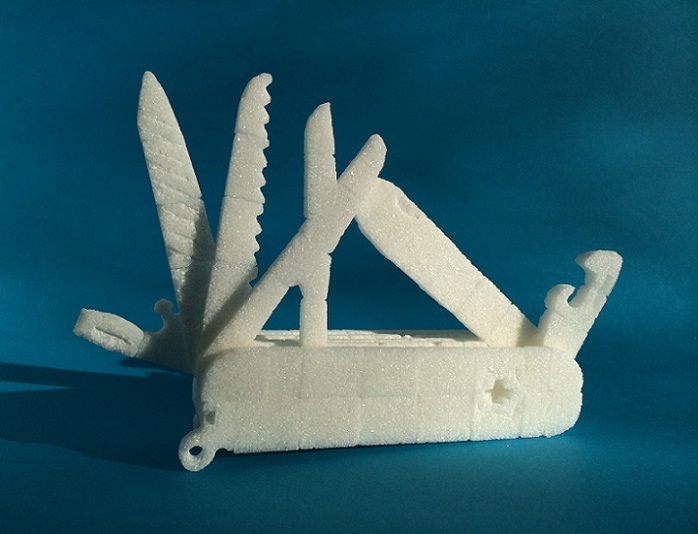 The award will fund an exhibition of wool forklift sculptures in March 2015 in Beijing, China. The judges stated "the project is witty, exciting and has an innovative gender approach with excellent promotion of UK textiles". The Society promotes the study of textile disciplines and celebrates the	history and culture of textiles, both traditional and contemporary. Established in 1982 as an educational charity, the Society gives support	to students, designers, historians and practitioners though its educational	and professional awards. The Society's Journal, TEXT is published annually. 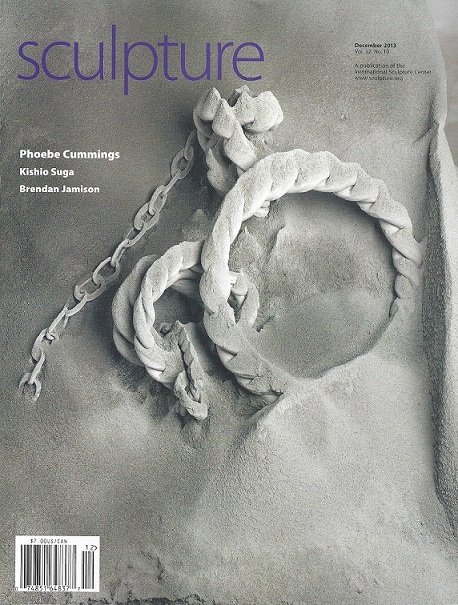 It's rare for Irish sculptors, particularly those from Northern Ireland, to have a high profile by the time they are in their early 30s, but Brendan Jamison, seemingly without effort, has propelled himself into the limelight and is unlikely to be dislodged in the near future. I say "seemingly" because Jamison makes everything look easy, which is, of course, the mark of the true professional. In fact, he is a meticulously hard worker and an unusually gifted artist who uses non-traditional sculptural materials. 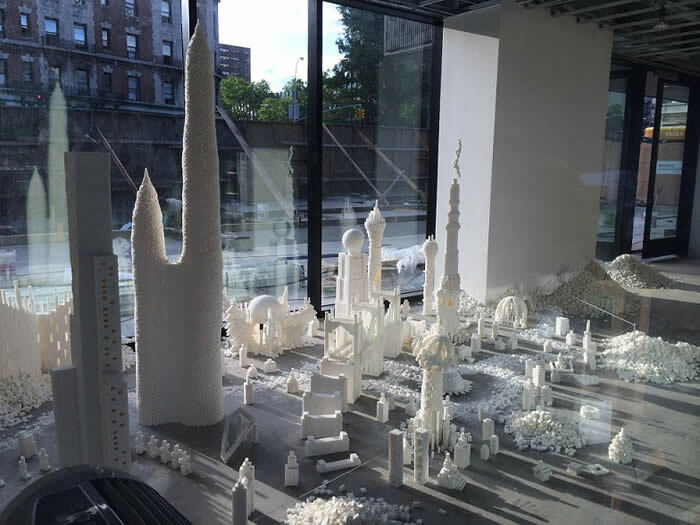 Over the past decade, he has shown across three continents, and he has a "nose" for the high profile, such as his sugar-cube sculptures of the Tate Gallery and No. 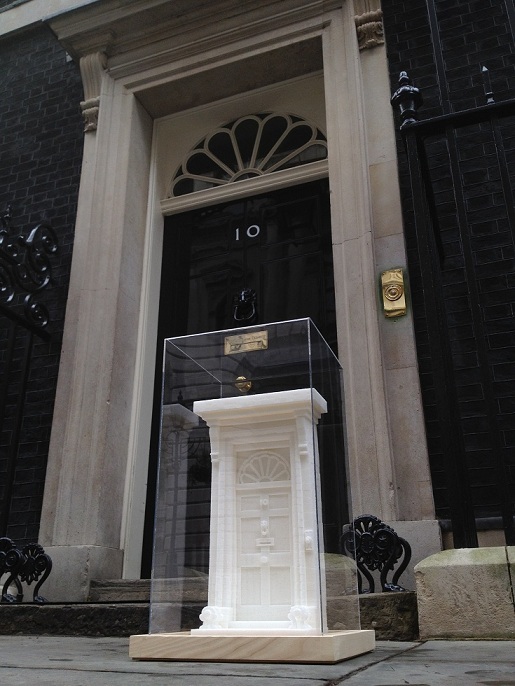 10 Downing Street (exhibited at that building). Jamison is quirky and shrewd - one of those rare sculptors whose work has a quiet sense of humor. He has also, unlike so many Irish male sculptors, managed to avoid the trap of an insistently phallic machismo. Jamison integrates his male and female selves. Watching his sculptural mutations is one of the pleasures of a critic's life. 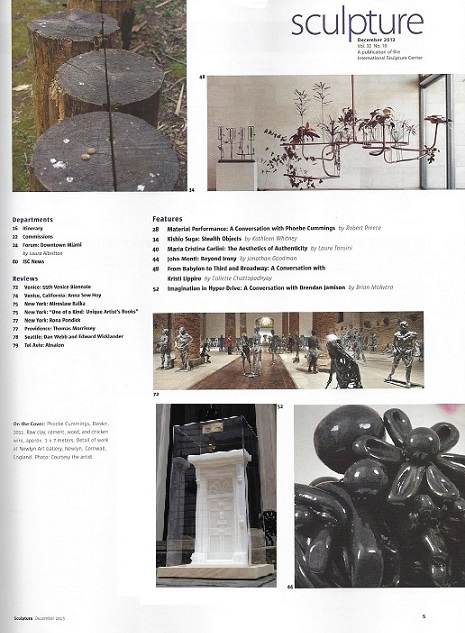 In October 2012, Brendan Jamison was elected to the Royal British Society of Sculptors (RBS) and the Royal Ulster Academy of Arts (RUA). 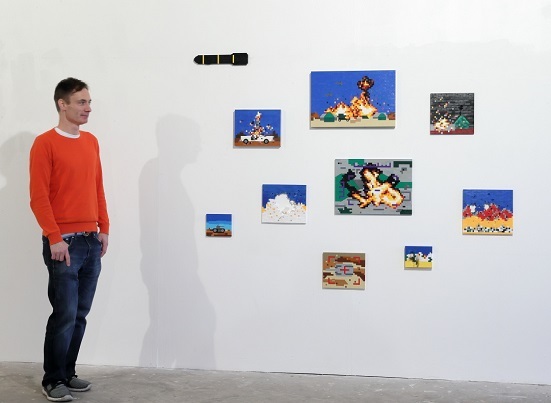 Pictured above: SUBMARIINES at the 'Interplanetary Revolutions' exhibiton in the Golden Thread Gallery, Belfast. 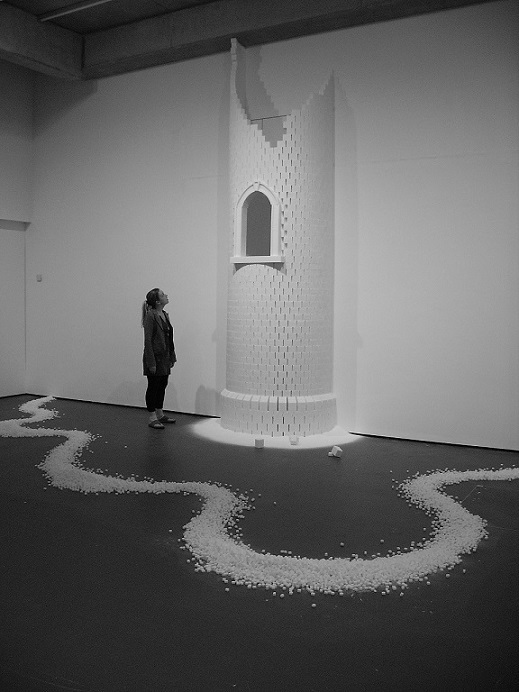 EASTBOURNE TOWER (2008-2011) Brendan Jamison, sugar cubes. 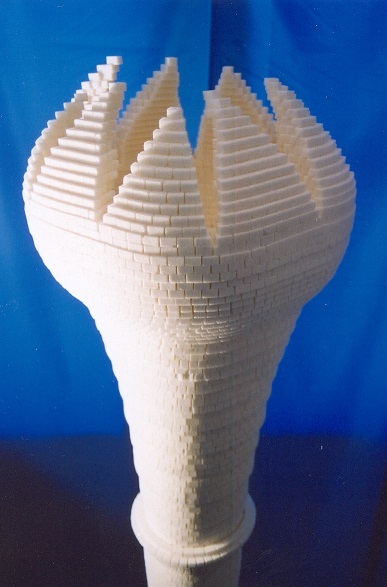 500 x 700 x 800 cm, tower with river of sugar cubes. 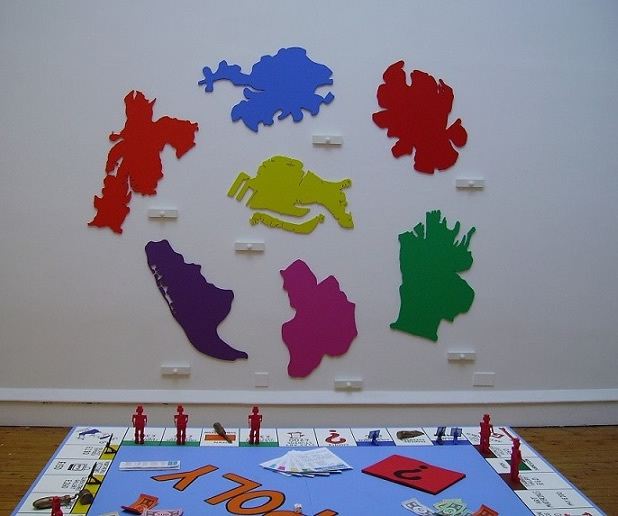 Installation at Towner Contemporary Art Museum, Eastbourne, England. 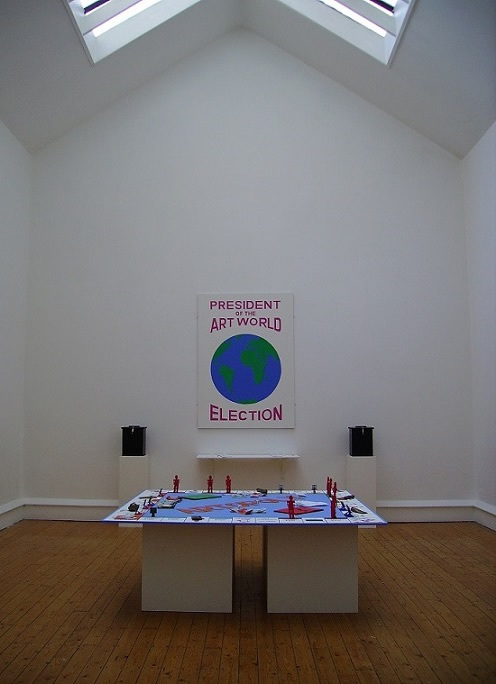 Exhibition curated by Sanna Moore, 1 July to 18 September 2011. 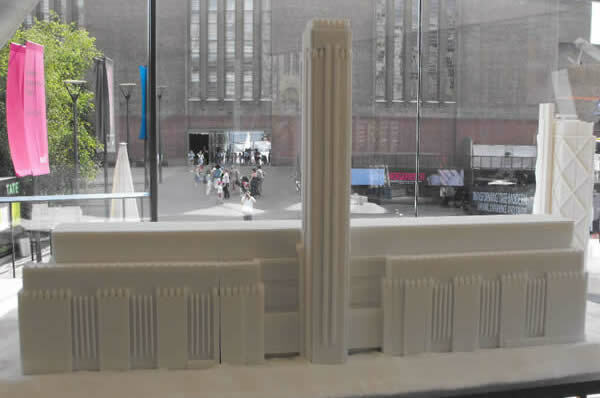 Sugar cube sculpture models commissioned by Native Land & Grosvenor for the 2010 London Festival of Architecture at the NEO Bankside Pavilion on the Southbank, London. NEO Bankside is designed by world-renowned architects Rogers Stirk Harbour + Partners. The original bankside power station was designed by Giles Gilbert Scott. It was transfomed into Tate Modern by Herzog and DeMeuron and opened to the public in 2000. 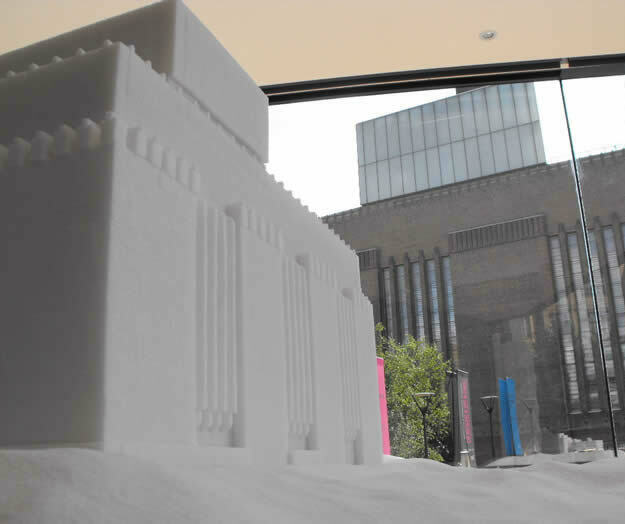 Pictured above: TATE MODERN (2010) Brendan Jamison, carved sugar cubes, 100 x 200 x 140 cm. 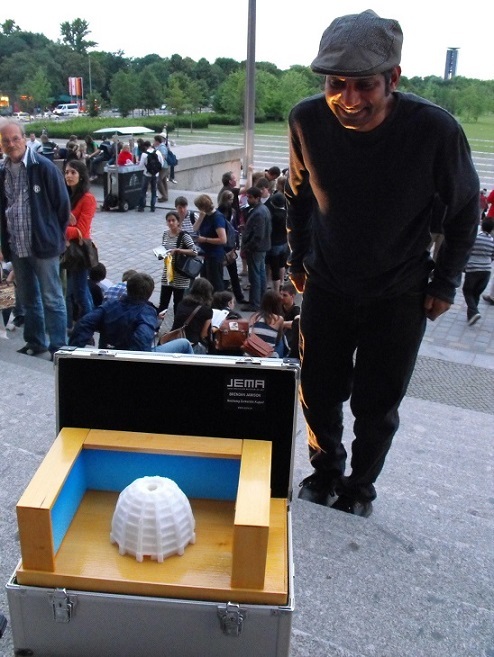 In commemoration of the 10th anniversary of Norman Foster's dome that was added to The Reichstag back in 1999, the John Erickson Museum of Art (JEMA) invited Brendan Jamison to build a sugar-cube version of the glass and metal edifice. 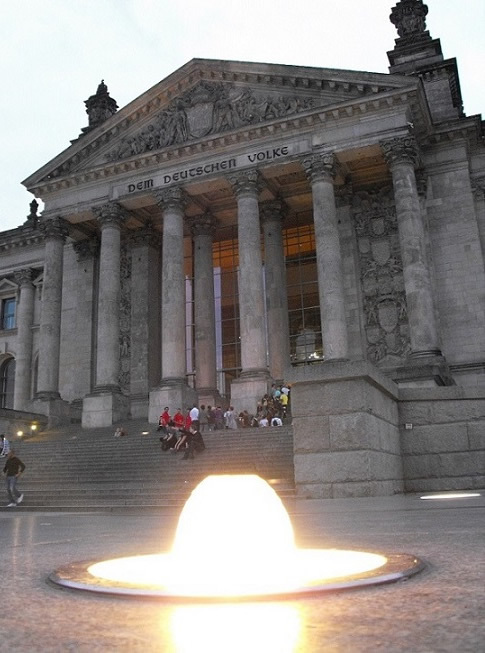 In homage to the iconic 1995 wrapping of The Reichstag (then domeless) by Christo and Jeanne-Claude, JEMA Director Sean Miller commissioned the production of a special wrapping fabric to cover the entire sugar sculpture and an unwrapping event took place at the front of The Reichstag. Several months later, JEMA travelled 'Reichstag Würfelzucker Kuppel' to the Samuel P. Harn Museum in Florida. 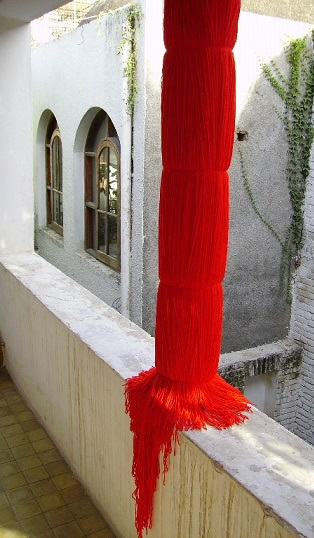 Pictured above: IN-BETWEEN (2008) Brendan Jamison, wool over wood, installation at Millennium Court Arts Centre,Portadown, N. Ireland. RED TUNNEL: 212 x 500 x 600 cm. 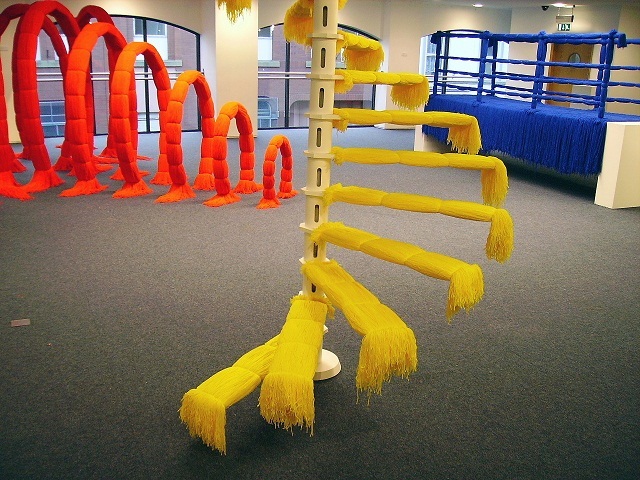 YELLOW SPIRAL STAIRCASE: 265 x 160 x 160 cm. BLUE BRIDGE: 180 x 392 x 120 cm. 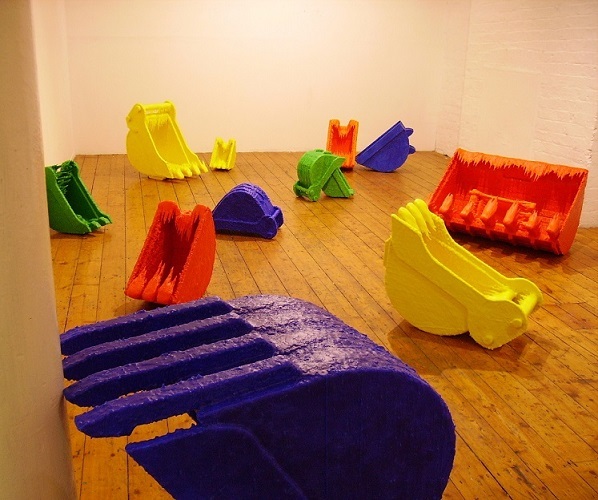 Pictured above: detail of DIGGER BUCKET SERIES (2007-2008) Brendan Jamison, microcrystalline and paraffin wax over wood, 15 sculptures, dimensions ranging from 30 x 20 x 25 cm to 76 x 70 x 58 cm. Queen Street Studios Gallery, Belfast, Northern Ireland. 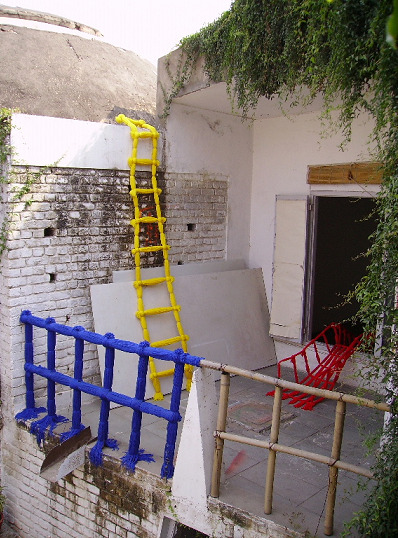 Pictured above: AN OTHER WORLD (2006) Brendan Jamison, Site-specific installation at KHOJ, New Delhi, India, red wool bridge, blue wool railing, yellow wool ladder and red wool column. Pictured above: detail images of IN-BETWEEN (2004) Brendan Jamison. Installation of 7 sugar cube sculptures with blue fabric, heights: 285 cm, 210 cm, 185cm, 180 cm, 150 cm, 120 cm and 95 cm. School of Art & Design, University of Ulster, Belfast. 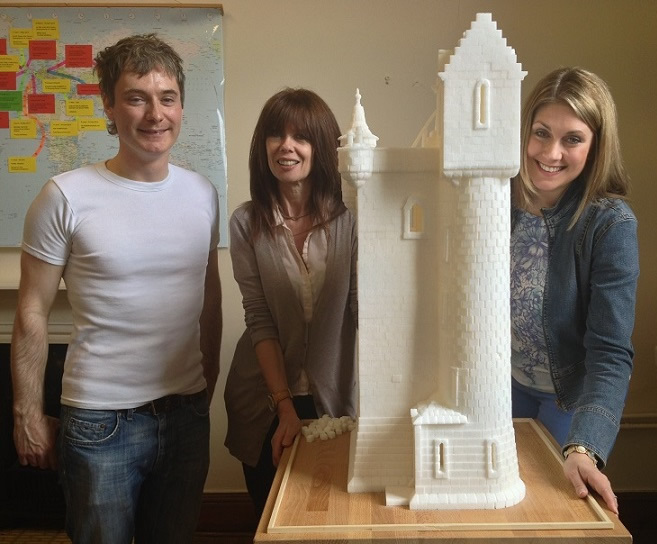 Sir Henry Tate's Mausoleum, a carved sugar cube sculpture by Brendan Jamison, is on display in the entrance lobby of the Belfast Model School for Girls in Northern Ireland. 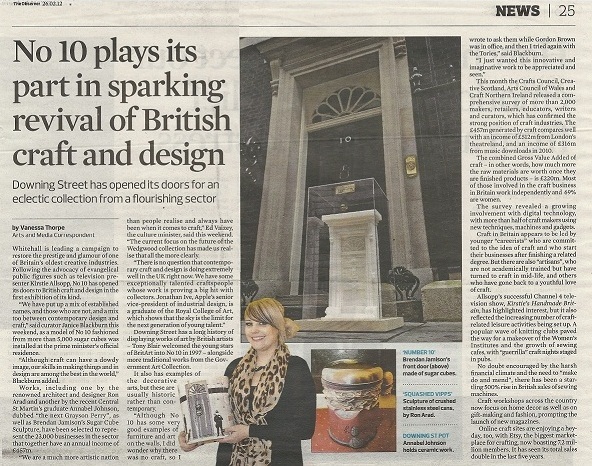 The sculpture took 3 months to carve and is part of the Arts Council of Northern Ireland Contemporary Art Collection. In 1897, As a gift to the nation, sugar cube manufacturer Henry Tate donated his art collection and the funds to build the first Tate Gallery, now known as Tate Britain in London. Jamison’s intricate carving features detailed lettering through a pioneering technique he developed specifically for the project. It was originally exhibited at West Norwood Cemetery in London, the burial place of Sir Henry Tate. 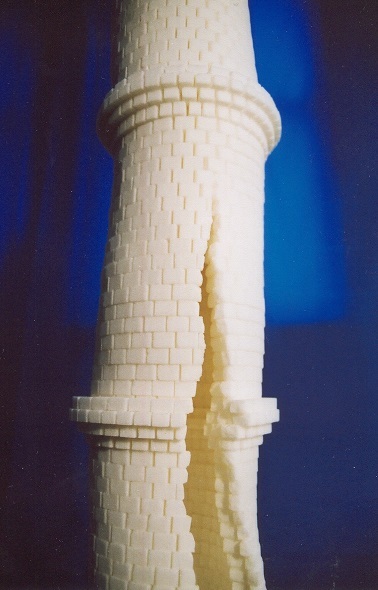 This carved sugar cube sculpture was published by Oxford University Press in a hardback encyclopedia of 897 pages: ‘The Oxford Companion to Sugar and Sweets’, edited by Darra Goldstein (ISBN 978-0-19-931339-6). 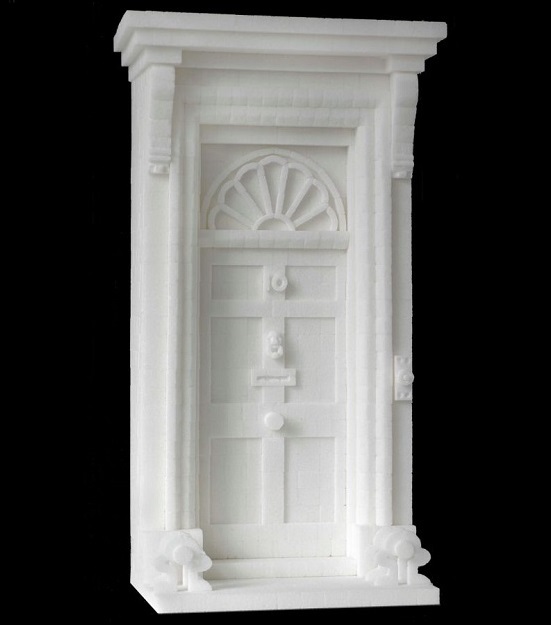 The Teacher's House, a carved sugar cube sculpture by Brendan Jamison, is on permanent display in the entrance lobby of the Teacher's House, 57 Volodymyr Street, Kyiv, Ukraine. Originally built in 1912 for the Kyiv Pedagogical Museum, the building famously hosted Ukraine’s first Parliament, the Central Council of Ukraine, from 1917-1918. The sculpture was commissioned by IZOLYATSIA Arts Foundation and it was donated to the Teacher's House on Friday November 4, 2016. Daily opening times: 10:00 to 17:00 Monday to Sunday. FREE ENTRY. For further images please CLICK HERE. 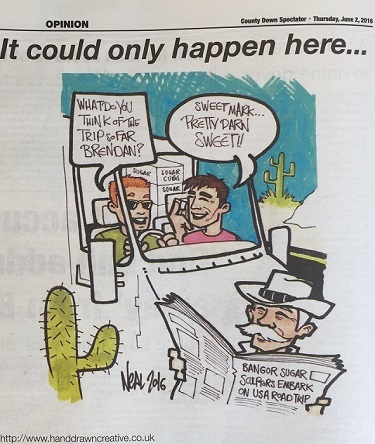 From America to China, Denmark to Singapore, over the past 15 years, Jamison's art practice has received over 1,000 pieces of media coverage across television, radio, newspaper and magazine articles. 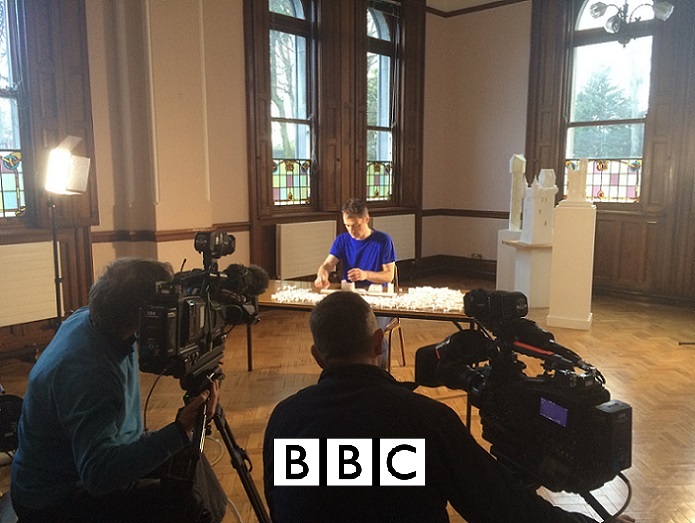 19 March 2015: Exclusive BBC Two interview at Jamison Sculpture Studio. Broadcast on The Arts Show.